There’s been a lot of talk about record-breaking Big Years around here in the wake of Neil Hayward’s attempt at Sandy Komito’s record, but Neil wasn’t the only birder gunning for birding immortality in 2013. Ron Beck of Arizona set what is likely to be a record for a Big Year undertaken entirely undertaken by bicycle and foot in Cochise County, Arizona. Tom Leskiw talked to Ron about his amazing year, and what he hoped to accomplish with it. Tom’s Note: During late 2012, I learned of Ron Beck’s plans for doing a Carbon-free (solely on foot or bike) Cochise County Big Year in 2013. Although readers may not know the exact location of this county in southeastern Arizona, you’re certainly familiar with the famous birding locations contained within its borders: the Chiricahua and Huachuca Mountains, including Ramsey Canyon; the San Pedro River; Sulphur Springs Valley; Whitewater Draw; Willcox Playa, etc. Ron has been birding since he was a teenager in southern California, where he searched for rarities in the early ‘70s with Jon Dunn. He and his wife Janet Cunningham moved to Hereford in Cochise County in 2011, following his retirement. I’ve always considered a Carbon-free Big Year a noble undertaking. However, any thoughts of personally doing one were swiftly preempted with the rationale, “Sure, it’s great… for 20- or 30-somethings.” Then, I found out that Ron’s the same age as I am: 59. For this reason, Ron’s accomplishment looms large and serves as an inspiration for the rest of us. My wife Sue and I sat down to interview Ron on December 19. When my participation in four CBCs threatened to derail the interview transcription process, my wife stepped in and completed the task, for which I am most grateful. TOM: I’m curious if there was a watershed moment that convinced you to undertake this quest, or was it the culmination of several experiences or observations? Could you share your thoughts on why you felt compelled to do this? RON: It was a culmination of things. I’d spent 30 years birding by bicycle in Los Angeles. Then, I read an article in the July 2012 issue of Birding about “Green” County Big Days that also mentioned the Green County Big Year record of 318 species in San Luis Obispo, CA by Jim Royer. I was riding with the “Downhill to Breakfast Club” in Cochise County, AZ and brought up the idea of doing a Big Year here. Two fellow riders were County Supervisor Pat Call and Robert Weissler, who is executive director of the nonprofit Friends of the San Pedro River (FSPR), whose mission is the conservation and restoration of the River through advocacy, education, interpretation, and field work. Pat suggested doing a Big Year as a fundraiser for FSPR. A Bicycling Big Year combines two of my favorite pastimes. The hardest part was figuring out how many birds to shoot for. There also wasn’t much planning time, as it was November 2012 when I decided to go ahead. TOM: Nearly lost in the discussion about reducing one’s carbon footprint when doing a Carbon-free Big Year is that motorized vehicles buffer us from the extremes of weather. Southeastern Arizona is no stranger to extreme weather: heat and cold; wind, thunder-, snow-, and dust storms; monsoonal rain and hail. Could you share with us one or more stories of birding this past year that involved extreme weather, including the season, target species for the day… and if the weather made you question your year’s quest? RON: I was lucky to skirt bad weather most of the time. The only weather impediment was wind. It seems that every time I had a great birding day, it would be followed by strong headwinds on the ride home. It didn’t seem to matter what direction I was traveling. I was always riding into the wind! There was some cold, too. For example, I got up at 5:30 a.m. on December 15 to follow up on reports of two birds I needed: Green Kingfisher and Least Bittern. FSPR river walk participants had spotted them along the San Pedro River the previous day. It was well below freezing when I reached the River and spent a fruitless day looking for these species. In fact, Green Kingfisher [the signature bird embroidered on FSPR baseball caps and T-shirts] was a nemesis bird for my Big Year. I chased every one of the four reported in 2013, making at least six different exhaustive trips. Another nemesis species was Rose-breasted Grosbeak; I missed 3 reported in spring and 2 in fall at people’s feeders. TOM: Could you share your thoughts regarding the fundraising aspect of your year-long effort? RON: FSPR needed to raise $15,000 to win a matching grant from the Conservation Lands Foundation. Two thirds of that sum had to be from people who had never before donated to the nonprofit. People can sponsor my effort by pledging either a flat amount or pay on a per-bird basis, from 25 cents to $1. I believe that I’ve raised somewhere around $4500 so far. I am kicking in $2 per species tallied, because I believe in FSPR’s mission and wanted to give money in addition to my physical effort. I’ve been told this is FSPR’s largest fundraiser ever. When friends come to visit, I take them to the River, then ask them for support. TOM: Hindsight being 20-20, what would you have done differently? RON: Because I was literally winging it on the fundraising, I made mistakes. There needed to be more contacting of local businesses, to grease the wheels ahead of time, and I only decided to do the Big Year in November 2012. One other shortcoming was that I only had two types of bike the first half of the year: a mountain bike with knobby tires for unpaved roads and a road bike with skinny tires for pavement. 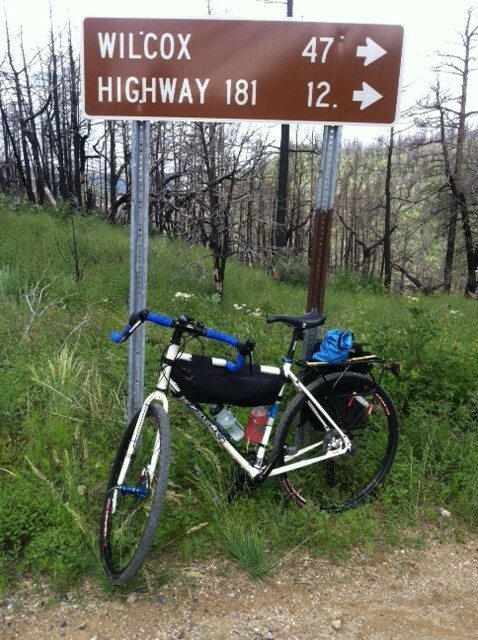 In June, during a visit to Colorado, I bought a touring bike with in-between width tires, to make that transition from asphalt to dirt. Having a touring bike would have made it easier to do more overnight trips to Willcox or Benson, which likely would have yielded five or six more shorebird species. Also, I took very few photos and I didn’t do a blog or weekly email updates about my travels. TOM: One of the benefits of spending so much time in the field in pursuit of birds is the opportunity to observe other kinds of wildlife or unique or rarely seen avian behavior. Could you share an experience along these lines? RON: This was an easy year for field interactions: I didn’t run into javelina, Mojave rattlers, or drug smugglers/illegals crossing the border. The non-avian highlight was climbing Carr Peak with Bruce Berman and seeing a twin-spotted rattlesnake. People can spend their whole lives looking for this tiny high-elevation reptile. Another time, I was hiking Huachuca Canyon with my wife and came upon a mama black bear with her cub. We were only 50 or 60 feet away. The bears stood up, grunted, and looked at us before ambling off. I also ran across several sauntering bobcats during my Big Year. TOM: Where I live, behind the Redwood Curtain in northwestern California, makes it very difficult to chase state rarities. For instance, the southeastern part of the state is about 800 miles away. For this reason, I keep a state list, but I’m quite casual about it. Where do you live relative to the geographical center of Cochise County? RON: The geographic center of the county is about 40 miles northeast, as the crow flies, from my house in Hereford. TOM: What was the furthest spot that you traveled to and how did you get there? RON: That would be Cave Creek in the Chiracahuas. It was 157 miles one way (370 miles round-trip, including side trips) and required riding 20 miles of dirt road over Onion Saddle. On the way, I suffered massive leg cramps about 10 miles out of Willcox that caused me to spend 2 nights in a hotel there. I camped out 4 nights in Cave Creek. So, the total August trek there and back took 8 days and 7 nights. I saw Black-bellied Plover and Black Tern in the Willcox playa and Juniper Titmouse [at Walker House in Paradise], Mexican Chickadee, and Short-Tailed Hawk in the mountains. I never had anyone accompany me on these long trips. TOM: Can you estimate how many noteworthy birds found in the county by others during 2013 eluded you owing to their remote location? RON: As of today [December 19], I have seen 301 species in Cochise County during 2013, whereas the eBird tally is 356. It didn’t make sense to go after short-duration sightings (e.g., reports of migrants that would likely not linger very long at water features) or remote ones. For example, to visit Guadalupe Canyon – a 3-hour turnaround for cars – would have taken me 3 days by bike and involved riding 45 miles on a dirt road. I’ve never been a big chaser, but prefer to find my own birds. TOM: One of the more enjoyable projects I’ve ever worked on was 5 years of fieldwork in support of the “Atlas of the Breeding Birds of Humboldt County California,” where we confirmed the breeding of several new species. Did you have a similar experience or find what was thought to be a new breeding location for a species within Cochise County? Which species? RON: Since a breeding bird atlas has already been published for the State of Arizona, and Cochise is one of the most heavily birded counties, I didn’t expect to find anything new. I did observe two Rufous-winged Sparrows singing by Casa de San Pedro [a bed-and-breakfast in Hereford], but couldn’t get back in there during the monsoons. There are only a couple of breeding records for the species in our county. TOM: In my home California county of Humboldt, I’m among those who avidly keep a county list, currently at 426. I’m indebted to those who have helped me along the way. However, the aspect of listing that I’m paying increasing attention to these days is my personal found list. There’s an electric moment that accompanies discovery, one that certainly plays a big part in why we bird. Have you kept a separate list of those species you personally found in 2013? RON: I found 290 species myself and chased only 11. Sometimes, I found things by car, then returned on my bike. A bird I found but couldn’t count was Snowy Egret. One day in December, I had ridden 12 miles along the San Pedro, finding nothing new. Halfway through, I had to crash through 7-foot-high Johnson grass where the BLM hadn’t mowed the path. I called my wife and asked her to pick me up so we’d have time to make it to a bocce party. On the car ride home, a Snowy Egret flew over the road – at the least expected time of the year – and I couldn’t count it because I wasn’t on my bike! Incidentally, the last two species that I added to my list were Common Merganser (#300) and Common Goldeneye (#301). Funny that both have “Common” in their names, but they certainly weren’t for my list! TOM: A familiar refrain among birders is youth’s lack of interest in birding. Because your Big Year has raised the profile of birding, especially in southeastern Arizona, I was wondering if your project has been able to build bridges that encourage greater participation by young birders, who incidentally may be more up to the energy requirements of long-distance bicycling? RON: Although I hang with younger cyclists, they don’t seem to be interested in birds. I’m upfront about being a birder, but I don’t want to force others to participate. I wish that I had more solutions to offer about how to better acquaint youth with the joys of birding. TOM: How many flat tires did you get on your bikes during 2013? RON: Twenty-one total: 3 on my mountain bike and 18 during the first 1000 miles on my touring bike. 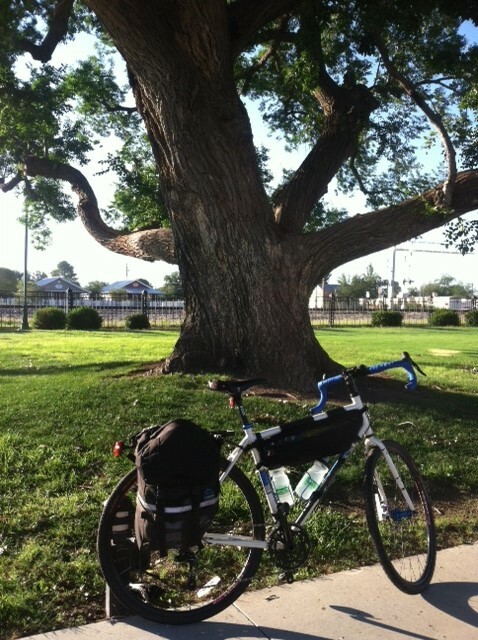 I was averaging a flat a week riding along the San Pedro and running over mesquite thorns. I carried lots of patches and 2 spare tires when I traveled. But after I switched to tubeless tires with no-leak sealant, I didn’t get any more flats. I didn’t have any bad crashes or instances where I fell off my bike. TOM: Do you have any idea of the miles traveled this past year? RON: To date, I’ve ridden 3067 miles, with every trip starting at Point A, my home in Hereford. About 10-15 percent of that was on dirt, the rest on asphalt. On top of that, I hiked between 500 and 600 miles. I spent 108 days doing the Big Year. I was out of the area about 4 months of the year. TOM: Some people consider using public transportation to be “Green” birding. What are your thoughts? RON: In my opinion, “Green” means “Carbon-free.” I don’t consider traveling by public transportation to be part of a “Green Big Year.” I’d create a different category for it called “Public Transit Big Year.” Personally, I like to keep the definition pure: what I’ve achieved has been done via human-powered transportation only — by bike or on foot, using no fossil fuel. TOM: Did you have an experience this past year that stood out above all the rest? It doesn’t have to be about birds per se; it might be storm-light over the Dragoon Mountains, inquisitive coatimundis, or …? RON: Finding the Sinaloa Wren on August 3 in Huachuca Canyon on Fort Huachuca. It was an adrenaline rush to spot a moulting, tail-less juvenile bird in the picnic area, then spend the next 2 hours in knots of confusion, trying to confirm my initial ID. I’d never seen a young bird so hard to identify. I was finally convinced by its ratchet call and song. My wife got a sound recording with her phone, and other people shot video and still pictures. Spotting a mega-rarity gave me a 2-week high. 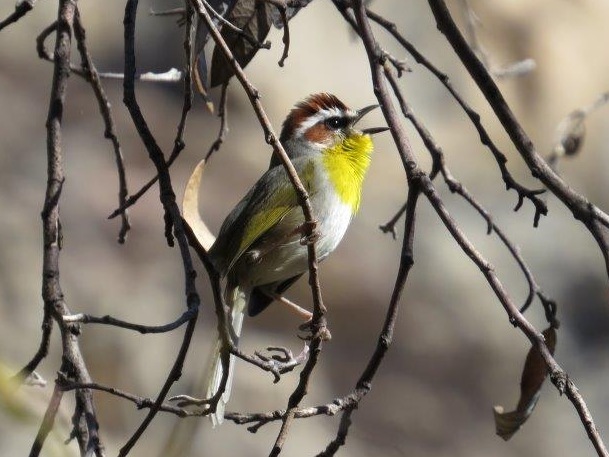 Finding a pair of Rufuous-capped Warblers in Miller Canyon in October would have to be another highlight of my Big Year. TOM: What are your plans for 2014? RON: I’m definitely taking 2014 off, but may do another Bicycling Big Year in the future. I came close to the record of 318, set in the coastal county of San Luis Obispo, CA. The neatest thing about doing this is finding out my shortcomings, fine-tuning any future strategies that would allow me to surpass the current record. If you are interested in donating to the fundraiser, more information can be found at http://www.sanpedroriver.org/fsprhome.shtml or https://www.facebook.com/fspraz.